In Acts 23:1 Paul claims to have “lived his life in good conscience up to this day.” In the context of a hearing before the Sanhedrin, it is possible to read this as a statement that he has been faithful to the Jewish Law. This is very similar to what Paul says in Acts 24:16 when he describes his entry into the Temple as “I always take pains to have a clear conscience toward both God and man.” He even points out that he was giving alms to the poor (the collection) and participating in a purification ritual when he was unjustly attacked. In fact, Paul was in the temple “purifying himself” (ἁγνίζω, Acts 21:24, 24:18). The verb is not normally associated with the Nazarite vow (which took thirty days, not the seven mentioned in Acts 21). The verb is used in John 11:55 for Jews purifying themselves prior to the Passover (cf., JW 6, 425, Ant. 12, 145). Pilgrims arriving in Jerusalem from Gentile territory purified themselves in the Temple. In Num 19:12 the verb is used to purify oneself after touching a corpse. That Paul was willing to undergo this level of purity ritual at this point in his career indicates that he is still willing to “be a Jew among the Jews” (1 Cor 9:20). Paul goes a bit further and claims to be a Pharisee. After his exchange with the High Priest in Acts 23:2-5, Paul shifts the focus to the controversy between Pharisees and Sadducees (23:6-10). This maneuver has caused some commentators to criticize Paul. It is not an honest argument by Paul, he instigates a near riot between the two factions of the Sanhedrin. 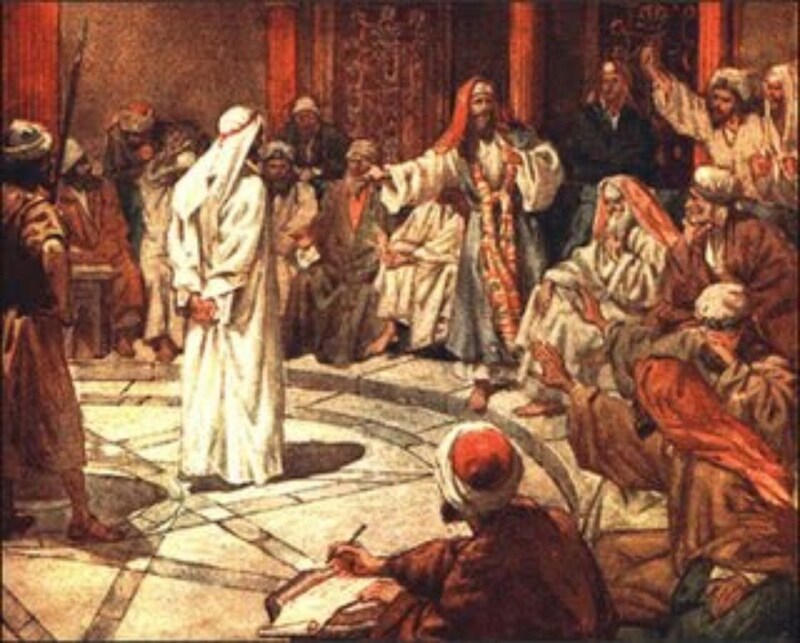 The Pharisees were a minority in the Sanhedrin, but a popular and vocal minority. They believed in the resurrection of the dead as well as angels and spirits. Is this true? Can Paul be considered a “practicing Pharisee” at this point in his ministry? For some interpreters, this is not at all the historical Paul who wrote Galatians. At the very least, he has broken purity traditions by eating with Gentiles. Yet with regard to the issue of the resurrection, he was a Pharisee. Paul is simply stating that he agrees on this major point, and for the Pharisees, at this moment, it is enough for them to defend Paul. While it was a crafty way of deflecting attention away from himself, it is possible that Paul was serious – with respect to the Law Paul has a clear conscience. James Dunn offers the suggestion that Paul’s statement was less for the Sanhedrin (which had probably already judged him as guilty), but for the Roman tribune and soldiers. The word conscience (συνείδησις) is a concept that does not really appear in Hebrew (Dunn, Beginning at Jerusalem, 974, n. 73, the word is only found in the LXX in Eccl. 10:29 and Wisdom 17:10). If he spoke Greek and used this particular expression, it is possible that he was claiming to the Romans that he was not guilty of any crime. What do we do with this incident? Is Paul playing both sides in order to gain converts? Did he really “keep the Law” while telling Gentiles to “not keep the Law”? I can think of a number of issues I might hold loosely so that I can reach both sides. Perhaps there is an application to Christian involvement in politics or other social issues. If Paul was on the side of the Pharisees, his shift in argumentation may have arose from a desire to discuss something more important than whether or not he was guilty according to the Law. Though Paul may have been being tricky in shifting the accusations and argument, maybe he saw the opportunity to address an issue that the Sadducees needed to rethink. The gospel that He preaches is based on the resurrection of the dead, namely Christ’s resurrection. He brings to the forefront that he is on trial due “to the hope and the resurrection of the dead” (v. 6). If his trial was based on this divisive topic, then maybe it would have been a point on which the Pharisees would have sided with him and the Sadducees would have diverted their attentions onto the topic of the resurrection of the dead instead of on Paul. If the resurrection of the dead is a vital ground on which the gospel stands, we have to come to terms with the truth and understanding that to some people it will most certainly be offensive. Paul’s abidance to the law allowed him to stand before the council during this trial and declare his innocence, while at the same time fully committing himself to the fundamental truths that uphold the gospel. I believe we need to do the same. *Knowing Paul was on the side of the Pharisees,….. I think this goes back to the idea of whether or not Paul ever actually “converted” in our modern sense of the term. While I was always under the impression that Paul had been a Jew and became a Christian, our discussions and study into this matter has solidly changed my mind on the subject. Certainly Paul underwent a major change of heart, and went from being a man without a true saving faith to a man with true saving faith, neither Acts nor the Epistles give us an indication that Paul ever stopped being Jewish. Instead of abandoning everything about being Jewish, Paul seems to have simply adopted a new mindset in which Jews could be Jews and Gentiles could be Gentiles, and both could be God’s people through Christ. In this gracious paradigm, Paul was able to witness to Jew and Gentile alike, becoming “all things to all people so that by all possible means [he] might save some” (I Corinthians 9:22).